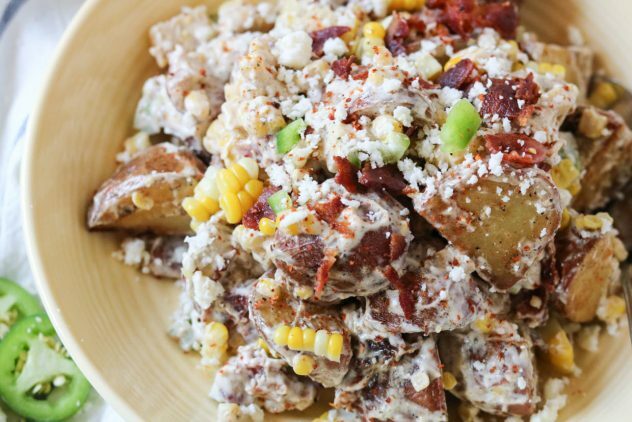 If you’re anything like me, I am bored with the same ol’, same ol’ potato salad served up at every summer BBQ or potluck. I wanted something new, something fresh, and something flavorful. 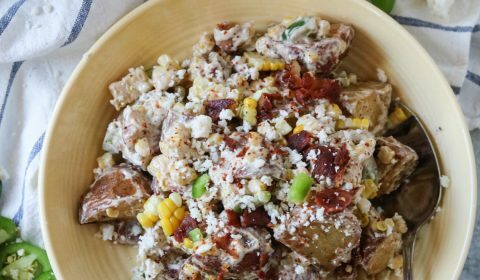 This southwest potato salad brings all of the flavors of Mexican street corn into a new fresh twist on the traditional potato salad recipe. This southwest recipe uses all of my favorite flavors like cumin, Tajin, cotija cheese, jalapeno, and more! 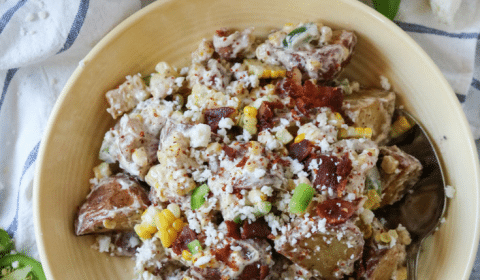 I almost started to make this a non-dairy potato salad to make it a little more summer potluck friendly, but I just couldn’t resist adding the creamy layer of the Mexican street corn sauce to this recipe. If you need a non-dairy option, you could definitely leave the sauce portion off and still have tons of flavor. Just throwing that out there as an option. I try to make most of my recipes as versatile as possible to accommodate for specific dietary requirements. My teenagers also approved of this recipe, even the pickiest one of them all! 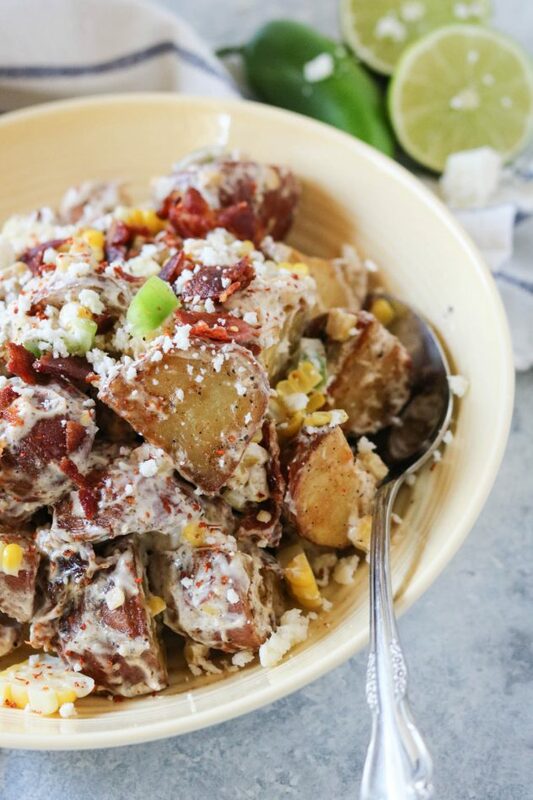 This southwest potato salad was such a refreshing break from the traditional mayo + mustard-based potato salad. The fresh corn off the cob, the bacon, the street corn sauce, topped with the cotija cheese and jalapeno…so many flavors! Whip this up when you head out for your next potluck gathering and you’ll be sure to impress your friends and family. 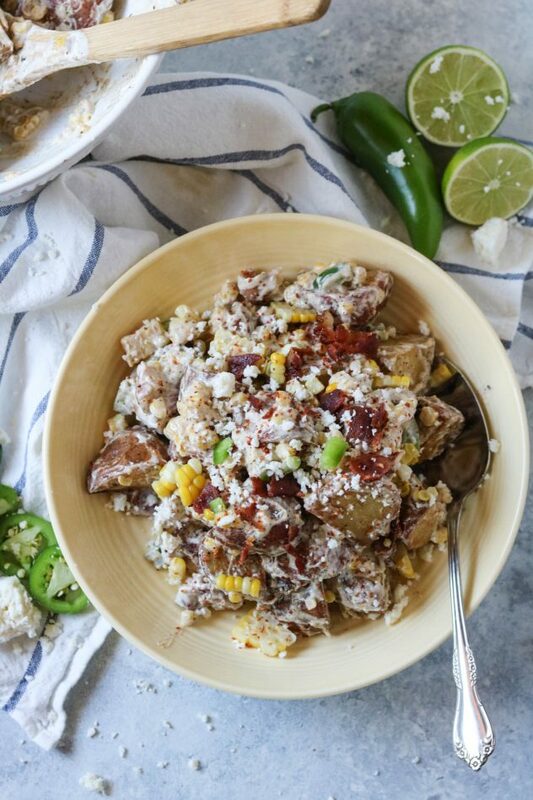 This southwest potato salad brings all the flavors of Mexican street corn into a fresh, new twist on traditional potato salad. Slice baby red potatoes in half and add to a large 9×13 baking dish. Drizzle potatoes with avocado oil, then season with tajin and cumin. Using a spoon, gently stir the potatoes to coat them with the oil and spices, then place in the oven to bake for 50 minutes. While the potatoes are baking, boil your corn on the cob. Fill a large stockpot with water, bring to a boil, add shucked corn cobs and boil for 5-7 minutes. Remove from water and let cool. Once cooled, cut the corn off of the cob and set aside. In a skillet, cook the bacon slices. Remove from pan, let cool, then crumble. In a small bowl, combine the cream sauce ingredients and place into the refrigerator until ready to use. Once the potatoes are done cooking, remove from oven and let cool for a few minutes. Transfer the potatoes from the 9×13 dish to a large mixing bowl. Add the corn and crumbled bacon to the bowl. Dice the jalapeno into small pieces, add to bowl. Stir to combine. Next, add the cream sauce, stir to combine. Top with crumbled cotija cheese and serve.